Hydrometeorological conditions indicate that significant flooding could occur. Such flooding is neither certain nor imminent. Hydrometeorological conditions indicate that significant flooding can be expected during the outlook period. Significant flooding is already occurring or is forecast to occur during the outlook period. 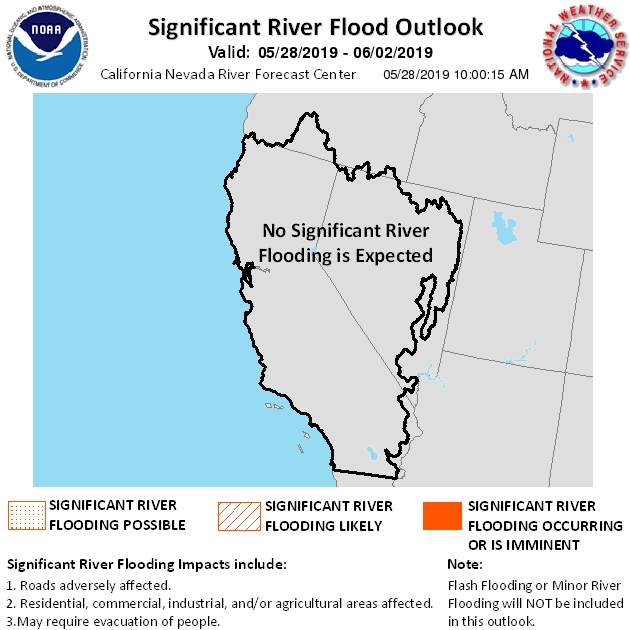 Notice: The Significant River Flood Outlook is intended to provide a general outlook for significant river flooding within the CNRFC area of responsibility. It is not intended to depict all small-scale events such as localized flooding and/or flash flooding. This graphic will not depict minor river flooding as this implies only minimal or no property damage with possibly some public inconvenience. Please refer to the hydrological products issued by local NWS offices for official river forecasts and warnings. The CNRFC uses 5 days of forecast precipitation and temperature in our 5-day river guidance products. This same information is reflected in this Significant Flood Outlook product.